THE final “piece” in the refurbish-ment of the Blessed Sacrament Prayer Chapel at St Brigid’s Church, Nerang, has been blessed and installed. 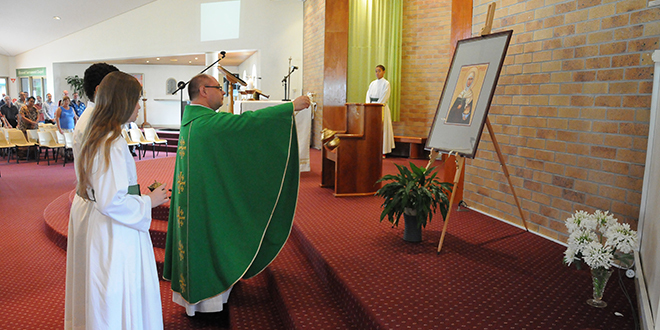 Nerang parish priest Fr Rafal Rucinski blessed an icon of St Brigid of Ireland during Mass on November 17. He said the icon, along with new security features, completed the refurbishment. The chapel is available 24 hours each day for parishioners to pray. “People need to come to pray at a time that suits them,” Fr Rucinski said. 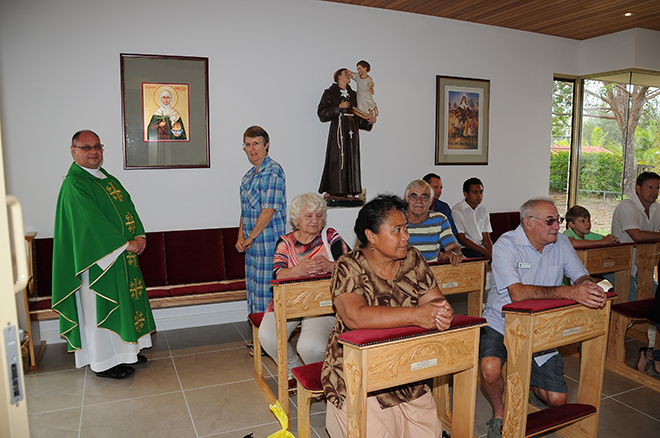 The refurbishment included a new tabernacle sourced from Poland, Fr Rucinski’s homeland, and timber kneelers hand-crafted by Polish artisan Janusz Blach. “This project was made possible by the support of parishioners, those who volunteered their time to carry out building, tiling and painting, to those who sponsored the construction of kneelers and seating,” Fr Rucinski said. Fr Rucinski said it was wonderful to have so many of those involved in the work present for the icon-blessing and community celebration that followed.